Although I believe these two videos lay out an excellent case that the day, and thus the Sabbath, starts in the morning, I can understand how some may think what is being stated is just his opinions. As most of the time the videos are extrapolating, although there is verse mentioned I think lays it out that is not focused on in the videos. Not long ago a friend shared SUNRISE or SUNSET: When Does a Day Begin? with me, and it clearly lays out the case that the day starts in the morning from the Bible with no wiggle room. I believe the Book of Mormon teaches the same thing. Here are my favorite 14 points from 44 that I have received permission to republish from SUNRISE or SUNSET: When Does a Day Begin?. I am sharing these 14 again because I feel they are very direct and poignant and make such a strong case for the day, and thus Sabbath, starting in the morning. Also the original article is long, and good, I’m hoping to encourage people to seriously think about when the day starts, and thus the Sabbath, with these favorite 14 points that are made. If you like these 14 points, please consider talking the time to read the whole article SUNRISE or SUNSET: When Does a Day Begin?. Answer: On the surface this would appear to be the case, however a quick look into any concordance or lexicon will provide ample evidence that two words in each of the verses have been consistently and poorly translated. The Hebrew word in question here is (hayah #1961), which means: to exist, become, happen, occur, come to pass, follow, (see table below). But instead of any of these choices or a synonym of these, the words “so” and “and” have been applied in their place, making it appear that the night precedes the daylight. Question 18: What did Yahuah, our Creator give us to determine our days and our years, was it lights or darkness? Question 19: If a “day” begins at sunset, when it becomes dark, then when does a “night” begin? Answer: Day and night DO NOT both start simultaneously at the same moment. If so, they would be the same thing. A day starts when it becomes daylight (direct rays of sunlight) according to Judges 16:2. Night starts when it becomes dark, the time when the animals begin to creep about according to Psalm 104:20. The most striking of the examples above is the third one from Genesis 8:22, which illustrates this point with four unique comparisons. Each of these comparisons are total opposites found in nature, illustrating day and night as the ultimate epitome of opposites. Question 21: When the Scriptures speak about the break of day in 2 Samuel 2:32, Judges 19:25 and Job 7:4; is this speaking of sunrise or sunset? Answer: Both are speaking of sunrise as the break of day. We can know with certainty that the daybreak here spoken of is specific to sunrise, because it is clarified that these things occurred all night. 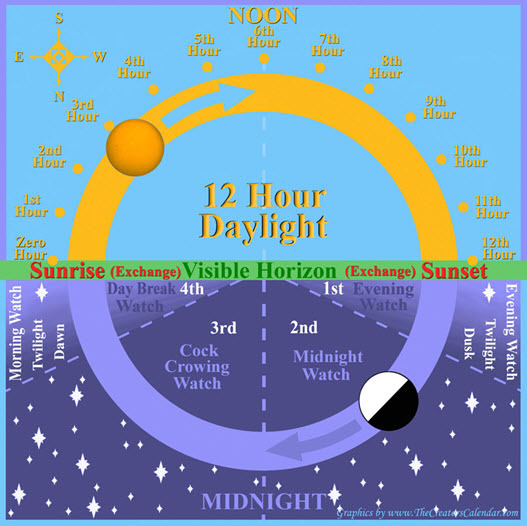 The twilight period is known as the fourth watch of the night or the Daybreak Watch. Daybreak itself is synonymous with the sunrise. 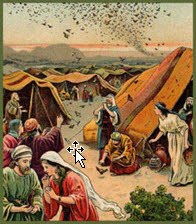 Question 26: In Numbers 11:32, it says that the Children of Israel gathered the quail all that day, and all that night, and all the next day. So how many days and how many nights did they gather quail? Answer: They gathered quail for two daylights and one night. But if a day begins at night then they would have gathered quail three days and three nights. But the most profound evidence in the verse above is the inference that the night followed the day. So the night that belonged to the first day mentioned was the night that followed it. Then the reference was made that the second day mentioned was the “next day.” From this verse, the day begins at sunrise, and NOT at sunset. Question 27: If the day begins at sunrise, then why do the Scripture verses that describe when the Messiah was resurrected, say “early in the morning” while it was yet dark? #4404 (proi) = at dawn; by implication, the Daybreak Watch. 1. Proi is the fourth watch of the night. Please do not miss this point. 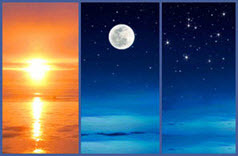 Dawn and dusk are both equated with the night and not with the day. It is in these very Scripture verses intended to prove that dawn is part of the day that the weight of evidence is given to the contrary. Dawn is synonymous with the last watch of the night. These verses include all the time references in the Brit Hadasha (NT) to the Resurrection. For a full break down with illustrations, refer to article: Three Days and Three Nights, the Sign of Yonah Riddle Solved. ined by the daily manna? 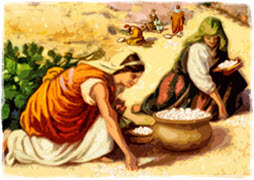 Answer: In the loving Father’s tender care, He rained manna from the shamayim for forty years in the wilderness to feed the newly released Israelites whom He had miraculously led out of Egypt. 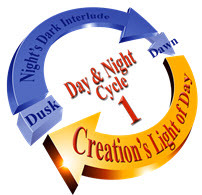 In addition to clarifying which day was the seventh-day Sabbath, there are several other time-centric details relating to the manna of great importance to Yahuah, which also illustrate when the day begins. He gave precise specifications regarding the gathering of the manna as He stated it would be used to test their obedience to Him. It was His ordained plan to use a feeding schedule to restore Israel back to His astro-luni-solar time system for synchronized worship. Here it is found that the Sabbath of the Eternal Father is the seventh-daylight and that it follows six work daylights. It is found that the day begins in the morning at sunrise rather than at night, as declared by Jewish fables and commandments of men (Titus 1:14). The manna could be preserved for exactly 24 hours from the time it was given, and always went bad the next morning when the fresh, new manna was provided at sunrise, except on the Sabbath. For on this day it was safely preserved for a minimum of 36 hours and a maximum of 48. We find that the term tomorrow is referred to as the next daylight that commences at sunrise. On the sixth day, Moses spoke of tomorrow as being the Sabbath day. If the Sabbath had begun at sunset, Moses would have spoken regarding the Sabbath tonight or at sunset. The Sabbath began in the morning, as depicted by no manna given on that morning. In this entire Exodus 16 narrative there is not one mention of the words night, sunset, dusk, or evening. The weight of evidence declares in this story alone that the day commences at sunrise in the morning. Question 30: According to Exodus18:13, when does “the next day” begin, in the evening, at midnight, or in the morning? Answer: The “next day” begins in the morning, as all of the Scriptures clearly indicate. You will never find Scripture declaring that the “next day” or tomorrow begins at night, but it always begins at sunrise. Further on that next day, Moses sat the entire day, from morning until evening. Question 31: According to Exodus 16:22-25, when does the “rest” of the sanctified Sabbath unto Yahuah begin, in the night, evening or in the morning? Answer: Notice that the reference made by Yahuah was made on the preparation day, declaring that tomorrow is the Sabbath rest. The Sabbath begins in the morning as all other days begin. Then when that next morning arrived we have a confirmation statement from Moses who said, “Eat that today, for today is a Sabbath to Yahuah.” This clarifies that the Sabbath began the next daylight at sunrise. Question 33: Why is it that the righteous men, obedient followers, are stirred up against the hypocrites? Who are the hypocrites and what did they do to deserve to be called hypocrites? Answer: The righteous men are stirred up against the hypocrites because the hypocrites make the Creator out to be a liar, when He said He separated the day from the night (Genesis 1:4). For the hypocrites have changed the night into day when our Creator had declared the LIGHT to be day and not the darkness of night. The hypocrites here referred to can be only one group of people— the Israelites or anyone who follows after their ways. For it was the Israelites who were given the oracles of the truth beginning with Abraham, Moses, Daniel, Isaiah, Jeremiah, and fulfilled by the Messiah. Only they can be called hypocrites for they had been given the direct honor of bearing the oracles of truth. Yet, since the first century A.D., under pressure from the Romans, they have changed every unit of time by 180 degrees, including when the day begins. Refer to article, TheCreator’s Calendar Units of Time. Answer: I was taught and believed most of my life that the reference to “from evening unto evening” here in Leviticus with regard to the Day of Atonement proved that the day began with sunset and ended with sunset. I no longer believe this is tied to the seventh-day day Sabbath for the very reason that the weight of evidence from Genesis to Revelation reveals that the day begins at sunrise. I believe this is a stand-alone verse uniquely designed to put parameters on the period of the Day of Atonement fast to aid in afflicting one’s soul. Basically this identifies that this fast is to be kept from “supper to supper.” So it appears that we are to eat the final meal of the day on the ninth, because at sunset the fast would begin. Then get a good night’s sleep and upon waking the next morning no food is to be eaten until after sunset. In this way the fast can have its effect and be an ever present reminder throughout the day of the fast of your need of Yahuah, bringing home upon the mind moment by moment, the importance of this day for humble confession. In contrast, if the fast did not begin until sunrise, folks would be up early eating a large meal just prior to sunrise, and utterly remove the effect the fast was designed to provide for afflicting one’s soul before Yahuah. Question 39: Genesis, Exodus, and Leviticus were the first three books written by Moses. If the time elements clarified in each of these books were not in perfect harmony with each other, Moses would have questioned Yahuah. It was Moses who recorded the Ten Commandments, including the fourth, which speaks specifically of the seventh-day Sabbath. Is there any reference in Scripture about commencing the Sabbath at night? Answer: Outside of the allusion of Genesis 1 and Leviticus 23:32, there is no reference to the Sabbath commencing at night or sunset, not even in Genesis 2:1. Leviticus 23:32 is clearly speaking of the Day of Atonement. The fourth commandment clearly states that the Sabbath was to occupy the period of time known as DAYLIGHT, during which time the sun ruled the visible sky, and no reference whatever is made to the darkness or night. However, some would have us think that following the crucifixion of Yahusha the Messiah, the legs of the two criminals were broken and they along with the Messiah, were removed from their crosses/stakes, because the “seventh-day Sabbath” was drawing on in three hours. Yet, we know for a fact that Passover was to begin in three hours as it was to commence at sunset. The immediate event that was drawing on was the Passover Feast, which was to begin precisely at sunset. All the Jewish men together with their families were to be at home for the event and they were commanded “not to step outside the door of their homes until morning” (Exodus 12:22). The seventh-day Sabbath was to commence the following morning at sunrise, at the exact moment Passover the 14th of Abib, ended. The seventh-day Sabbath is never mentioned in Scripture as overlapping, but rather it was always the day following Passover the 14th, and commenced at sunrise. It was the day of the seven-day Feast of Unleavened Bread that always commenced on the seventh-day Sabbath, making it a High Sabbath. The underlined portion of the following verse is defined in the Greek as “prosabbaton”#4315 and means the day or period before the Sabbath or Sabbath-eve. It clearly does not mean the commencement of the Sabbath, but the period prior to the Sabbath. The reference to “when evening had come” is clearly stated to be a time period prior to the commencement of the Sabbath. It was the continuation of the preparation, but it was the commencement of the Passover that had already begun at sunset. . . The word “day” does not exist in the original text. The word G#4315 prosabbaton simply means prior to the Sabbath. The other identifier in this verse declares that the sun had already set, as this is the meaning of the word #3798 opsias, which means night fall. Notice how this Renewed Covenant (NT) word G#3798 night fall is in harmony with the Torah (OT) H#6153 ereb, which means twilight. It is apparent that the Sabbath was yet to commence the following morning along with the Feast of Unleavened Bread. It was the Passover Feast that had just begun at sunset on the 14th. The preparation here mentioned was the sixth day of the week, because the following day was a High Sabbath. But the urgent preparation here is twofold. Here again, the word “day” was added by the translators. The first preparation is for the Passover Feast that commenced at sunset of the 14th. The Passover Feast lasts from sunset to sunrise the next morning of the 15th. The seventh-day Sabbath was not to commence until sunrise of the next day, at which point the Feast of Unleavened Bread commenced as well. High Sabbath was the term used when a yearly appointed Feast Sabbath landed on a regular seventh-day Sabbath. This occurs only twice per year, and in this case it was the first day of the Feast of Unleavened Bread. Sundial Below is an ancient Greek sundial, which by its very design is in harmony with Scripture (John 11:9). Although this sundial is missing its pointer (gnomon) notice the numerals are from left to right, beginning at number 1 and ending at number 12. This demonstrates that the 1st hour following sunrise is the 1st hour of the day. It also demonstrates that the 6th hour of the day is noon, and the 12th hour ends at precisely sunset. Whether it is summer or winter there are always twelve hours in a day, thus the hours vary in actual length from summer to winter, but there are always 12. By its very design, a sundial implies and requires the ruling body to arise in the east and set in the west. The ruling body must be of such significant brilliance as to emit rays that cast a shadow on the sundial. The sundial has no effect on the nights that the moon is in its dark occulted phase or has any portions of darkness. This is because all lunar phases that exhibit any portion of darkness also never rule the night sky from east to west beginning at sunset. It is only the full moon that shines from east to west and emits enough light to project upon the sundial. Sundials cannot measure dusk or dawn, as this would be a measurement of an absent sun that is not ruling. It is the unique design of the sundial that determines the measurable parameters of the sun ruling by day, separating the day from the night. And by extension, it can measure the night of the full New Moon, when it rules from east to west, all night. In striking contrast, the Roman Gregorian sundials follow a numeric system that displays the 12th hour as noon, correlating with a 24 hour day that commences at midnight. According to Scripture, noon was the 6th hour of the day and sunset was the 12th hour. In this way the boundary markers were set for our Creator’s days, distinctly divided from His nights (John 11:9). Question 40: During the life of the Messiah He kept the Sabbath for the correct length of time. If Israel was keeping it wrong, certainly He would have corrected them. How long did the Messiah declare a “day” to be, which would also apply to the seventh-day Sabbath day? Answer: If the Sabbath day begins at sunset or at the first light of dawn, as many people believe, then these verses would make no sense whatsoever. Scripture clearly defines that the corporate praise and worship of the Almighty Yahuah Alahim of the shamayim, is to be done from sunrise to sunset. Our personal and private prayers are heard and accepted anytime day or night.